Mitch McCullough June 16, 2015 Comment Now! At Laguna Seca, mistakes aren't forgiven easily. The benchmark track for enthusiasts has fistfuls of passages that give new meaning to the idea of a "technical" course. 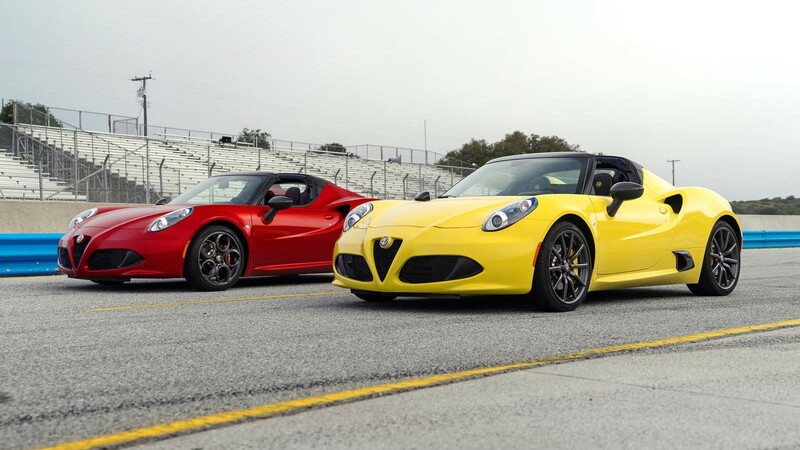 No worries: we're behind the wheel of the roof-less version of the car we named Motor Authority’s Best Car To Buy 2015—the 2015 Alfa Romeo 4C Spider. Alfa Romeo has launched this open-top version of the brilliant, highly-focused 4C sports car to keep interest stirring in the brand, which is set for a revival in the U.S. over the next few years. Next up: a sedan next to join the lineup later this year. But for now, it's just us, the clear sky above, our current car crush, and a green flag. Right off, we'll tell you that choosing between 4C coupe and Spider is mostly personal preference. There's no difference in driving dynamics. Construction is identical, with no modifications needed to stiffen the Spider. The 4C takes styling cues from the fabulous 1967 Tipo 33 Stradale, as well as philosophical cues: state of the art technology, incredible performance, Italian design and style. More important are the aesthetics: The 4C coupe has the purer shape, with its fastback profile and see-through engine cover. The Spider offers open-top motoring, with a little fabric top that can be pried loose in a few minutes and stowed in the trunk. I'd spring for the optional removable hardtop for appearance and security. In case you've forgotten, the 4C is fabricated around a 236-pound carbon fiber tub, which is three times stronger and seven times lighter than steel, with aluminum subframes affixed front and rear. Sheet-molded compound composite body panels in a choice of 17 colors surround the mid-engine sports car. Among production cars, only the LaFerrari, Aventador, McLaren 650S, and Porsche 918 Spyder are built like that, and their MSRPs are just a bit farther north. The displacement of the 4C's all-aluminum 1,750 cc engine recalls the fantastic 1929 Alfa Romeo 6C 1750 Super Sport, today worth seven figures, if you can get one. On the Alfa Romeo 4C, the 1.8-liter four-cylinder is blown at 21.75 psi by an intercooled turbocharger to develop 237 horsepower at 6,000 rpm and 258 pound-feet of torque at 4,250 rpm. That's enough to propel the 2,500-pound 4C from zero to 60 mph in just 4.1 seconds with a top speed of 160 mph, according to Alfa Romeo. Braking from 60-0 mph takes less than 100 feet, aided by big Brembos up front, and I detected no brake fade at Laguna Seca. 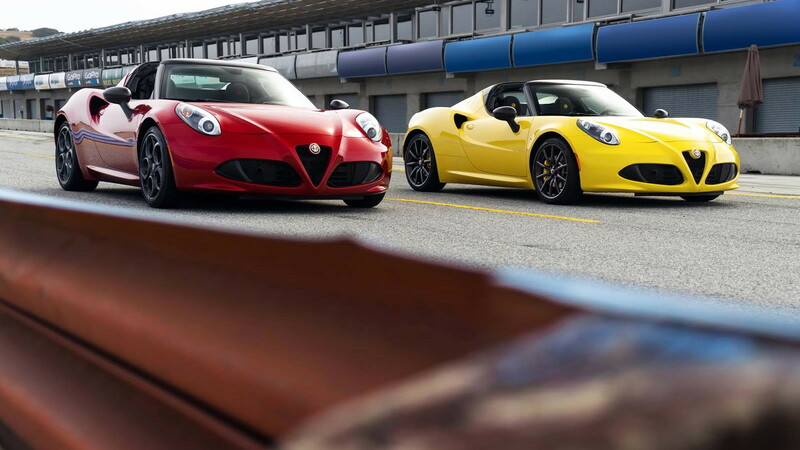 A 4C can pull 1.1 g around corners, once again according to Alfa Romeo’s own stats. Drive the 4C on a winding road or on a race track, and it reveals its true nature, and why we love it so. The front tires communicate their squirming discomfort extraordinarily well through the comfortable steering wheel and lose grip only gradually. This is a friendly car that never bites. 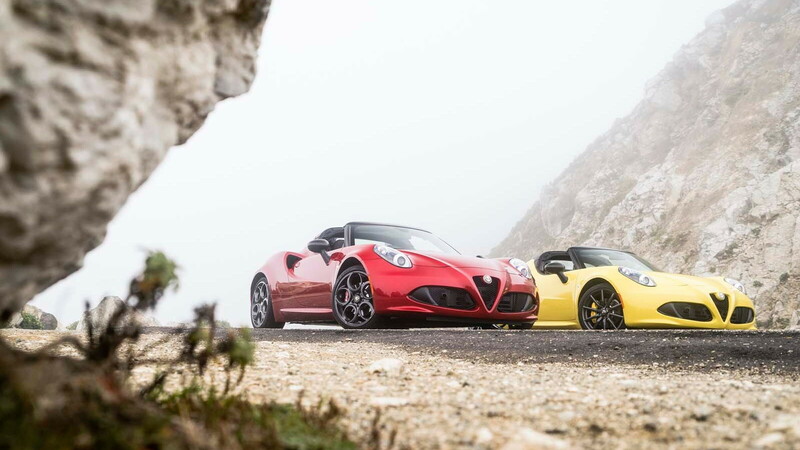 Despite the missing roof, the 4C Spider still steers with the responsiveness of a sports racer yet it is easy and fun to drive at the limits of its tires. We immediately discovered this at Mazda Raceway Laguna Seca, where we were able to get up to near-race speeds on our very first lap in the new car. The organizers wisely limited us to three-lap sessions to discourage an overabundance of confidence and enthusiasm. Their strategy was somewhat overcome, however, by the sure-footed handling of their 4C. Within just a few laps of getting on the track, our seventh after their well-planned interruptions, we were able to drive flat-out: accelerating from Turn 11, going into fourth gear by the time we reached the overhead walkway with the pedal to the floor as we crested the rise and swept around Turn 1, throttle firmly against the firewall, never easing off the slightest, until we reached the braking point for Turn 2. Few cars inspire that level of confidence in a driver of my average talent. Drivers who know this section of asphalt understand Laguna's Turn 1 is a real corner in faster cars. The apex is over a blind crest and line selection is important, so it takes some confidence in the car and in your own abilities to keep the pedal down here. 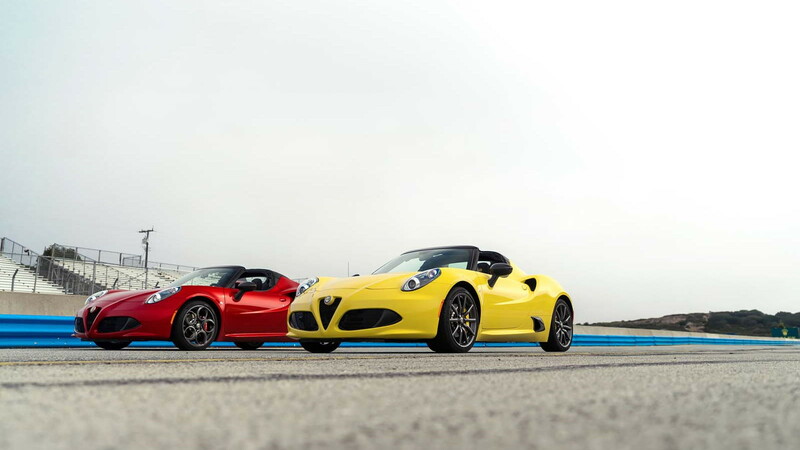 I could have spent the next 15 laps doing just that in the new 4C Spider. Light weight is the primary factor here. The coupe weighs 2,465 pounds, the Spider 2,487, a meaningless 22-lb difference. The Porsche Boxster and Cayman each weigh another 500 lb, which is like having three people climb into the car, while the Audi TTS and BMW Z4 each weigh 1,000 lb more than a 4C does. The standard suspension is not too soft, the race suspension is not too harsh. If you plan to run several track events a year, spring for the Track Package, if not, don't. I found the car stable at high speeds and easy to control when unsettled. On the road, the steering was so responsive that initially I found myself having to correct after turning in too much for a corner. The front tires sometimes want to follow contours in the road, possibly attributable to the tires, developed specifically for the 4C, or alignment settings that give it that quick turn-in response. This is not a luxury car. The 4C’s engine sounds wonderful, despite being a four-cylinder, with its wastegate emitting a satisfying chirp whenever the throttle is lifted. The car emotes passion like an Italian sports car four times as dear--no phony piped-in sound here. The TCT twin-clutch transmission switches gears in 130 milliseconds. It's easy to work and makes the car tractable at walking speeds, a characteristic a single-clutch automated manual cannot claim. The 4C felt powerful on winding roads, especially in Dynamic mode. On the race track, the turbocharged engine did not seem to have as much low-rpm torque as a Cayman does. Perhaps for this reason, a Cayman will likely power by a 4C on a long straightaway. However, the Alfa is quicker and more agile than the Porsche, and I think it’s the more fun to drive. There are the inevitable compromises, of course. As with a Lotus Elise, getting in and out of the 4C is awkward. Once in, my 5-foot, 9-inch frame was comfortable, and a 6-foot, 5-inch colleague said he found the 4C roomier than the new 2016 Mazda MX-5 Miata. The 4C Spiders we just drove seem more refined, with higher-quality cabins, than we recall from driving early prototypes of the 4C coupe a year ago. I'd opt for the leather-trimmed interior over the base boy-racer carbon fiber dash and door trim, though it is the real deal. As for seats, I preferred the leather, especially in red, though the Alcantara-like microfiber is suitably racy in black. 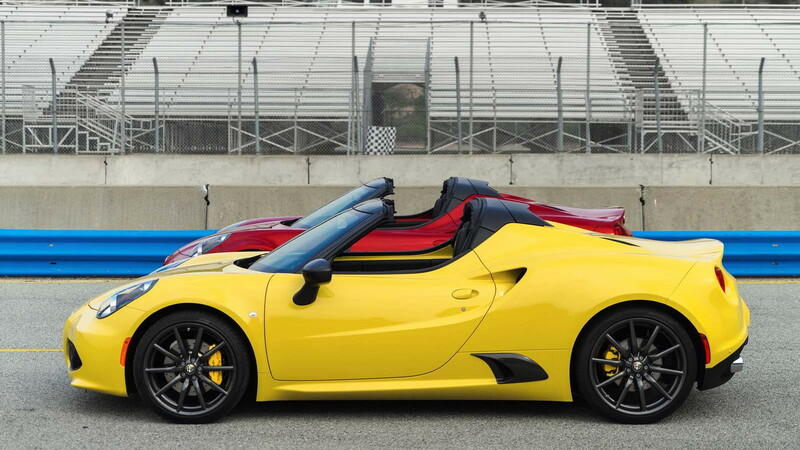 The 2015 Alfa Romeo 4C Spider retails for $63,900 (MSRP excluding $1,595 destination charge.) The 2015 Alfa Romeo 4C coupe Launch Edition is listed at $68,400. Average transaction price of the Alfa 4C is currently $72,000. These cars sell in extremely low volumes and it is unlikely you will see another while driving yours. Before placing your order, carefully study interior choices (leather or microfiber), tire and wheel selections (at least 17), suspension options (two), muffler selection (three) and, of course, body styles (two). Relax, and enjoy. You can't make any mistakes here--and you might as well refine your motoring nirvana.